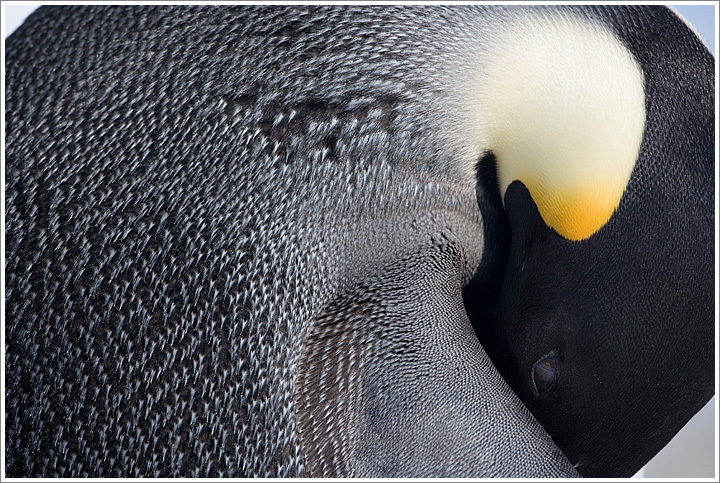 Close-up image of a sleeping Emperor Penguin (Aptenodytes forsteri) resting out on frozen sea ice on a sunny afternoon. Photographed October 26, 2006 with a Canon EOS-1Ds II camera and 500mm f/4 lens. Exposure 1/500 seconds at f/8. This entry was posted on Thursday, October 26th, 2006 at 10:21 pm. It is filed under On the Road and tagged with Antarctic Peninsula, Antarctica, Emperor Penguin, Penguins, Wildlife. You can follow any responses to this entry through the RSS 2.0 feed.